Varnavas is the Lead Country Manager and Vice President for ExxonMobil Exploration and Production Cyprus (Offshore) Ltd and the President and Managing Director of ExxonMobil Cyprus Ltd.
After receiving his MSc degree in Mechanical Engineering in 1986, and spending a short period in the industry, Varnavas joined Esso in Cyprus in 1987. 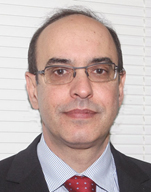 He served in various capacities in the Cyprus affiliate until 1997, when he was transferred to Esso UK, for a number of planning and commercial assignments. In 2000, following the Exxon Mobil merger, Varnavas joined the ExxonMobil Europe - Africa Head Quarter in Brussels where he spent 8 years covering commercial and engineering activities across Europe and Africa. In 2008 he returned to Cyprus to take on the lead role in the ExxonMobil Downstream affiliate, and in 2017, following the signing of an Exploration and Production Sharing Agreement with the Government of Cyprus, he took in addition the lead position in the ExxonMobil Upstream affiliate. Varnavas is an active member in a number of professional and non-profit organizations. He is married and has 2 sons 24 and 22 years old.